When you live in Singapore it was hard for a while not to come across cows placed in strategic locations around the city. This campaign came from the creative minds at Moove Media, the OOH media agency that manages advertising space on a number of buses, Comfort & DelGro taxis and the NEL MRT and DTL lines. The last few months they’ve created quite a buzz for their clients as well as themselves with two very visible campaigns. Time to meet with them and get the low down on how they work and what we can expect in the near future. Moove Media was founded in 2005 by Jayne Kwek. The agency now is the advertising arm of ComfortDelGro corporation that formed after the merger of Comfort Ads and SBS Transit Advertising. It has delivered a steady flow of creative ideas and campaigns for clients such as KFC, Ikea, Taiwan Tourism Board and Tiger Beer. 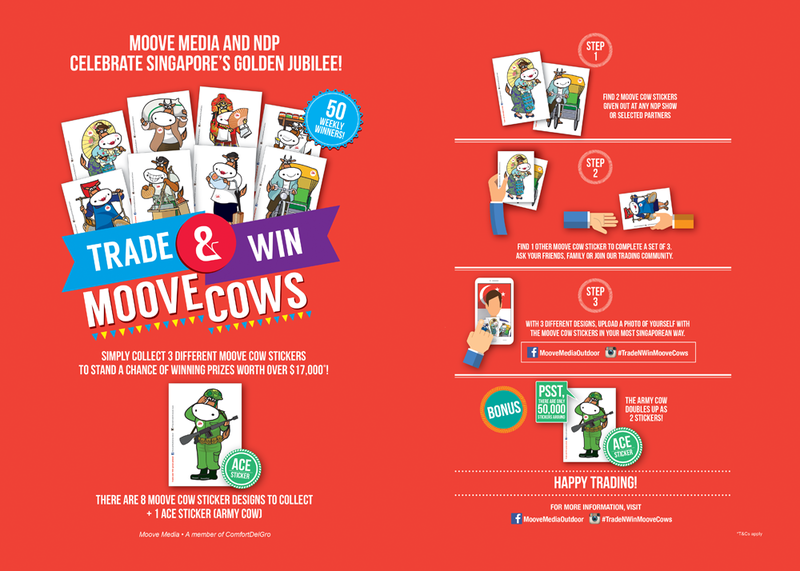 Moove is behind the 600 cows that were placed in 68 locations around Singapore from 22 June 2015 onwards for nearly 4 weeks. They were there to support the campaign, commissioned by the NPB, aimed at celebrating Singapore as a City in a garden. The NPB campaign ran for a few weeks and the main KPI for it was to get Singaporeans to post a selfie on social media with a caption. The target was to get 50 people to do this every week and ultimately the reached this after a slow start. The campaign was successful as it got a lot of media coverage and it will continue in a smaller set up with cows on 18 sites around Marina Bays Sands, the Singapore Flyer and the Barrage to commemorate the pioneer generation. This time around cow stickers are to be collected. Any combination of 3 out of 8 different cows could help participant win prices. There will be a number of army cows among that count for 2. In total 400,000 cow stickers will be distributed. Another thing that Singaporeans can’t escape is the “Spot me SG50” dots, plastered on buses and randomly on pavements and hallways in stations and malls. The campaign generates awareness among Singaporeans and tourists for the upcoming National Day which will commemorate Singapore’s 50th birthday as a nation. The objective of the Spot Me campaign was again to entice people to take pictures of the red dots mounted on the roofs of buses and taxis and post the picture with a caption on social media. This campaign was very successful as it got more than 3000 entries. 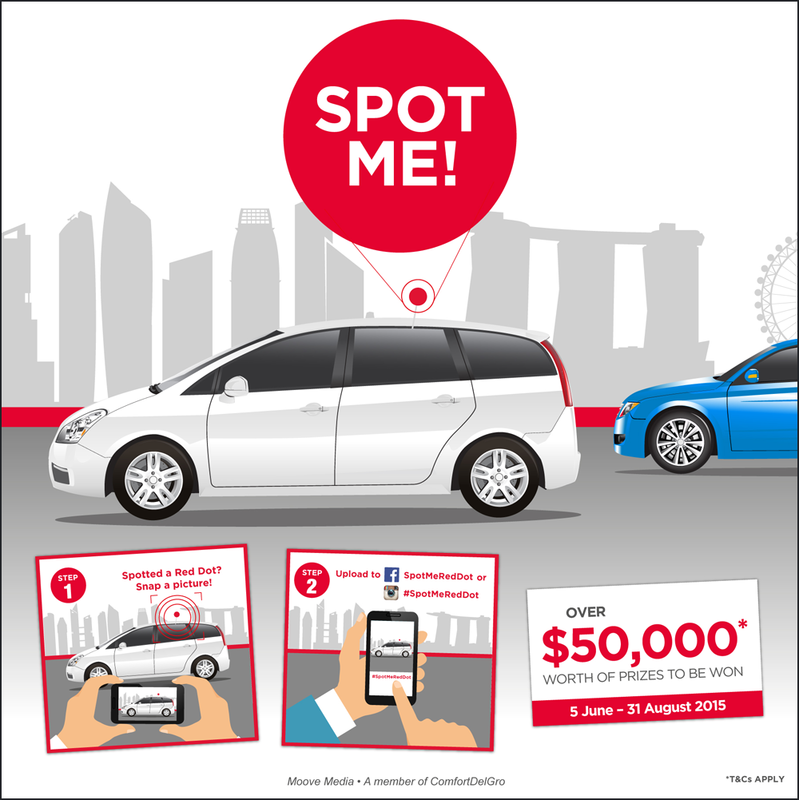 Those who have a red dot on their taxi or those who bought it are now invited to keep it until the end of August. This way they can win prices but it also extends the campaign till then. These campaigns show how Moove as an agency is truly Singaporean in its origin but also in the execution of its creative ideas. Moove is also following technological developments closely. 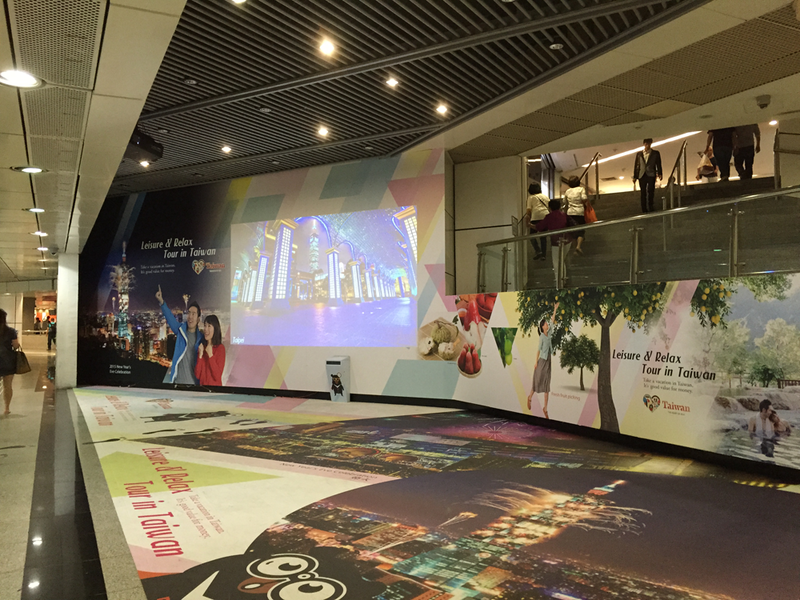 If you are a frequent MRT traveller and change at Dhoby Ghaut, you may have spotted the augmented reality billboard, next to the travelator between the red line and the purple line. The installation puts people virtually in Taiwan, the moment they step into a zone just before the screen. 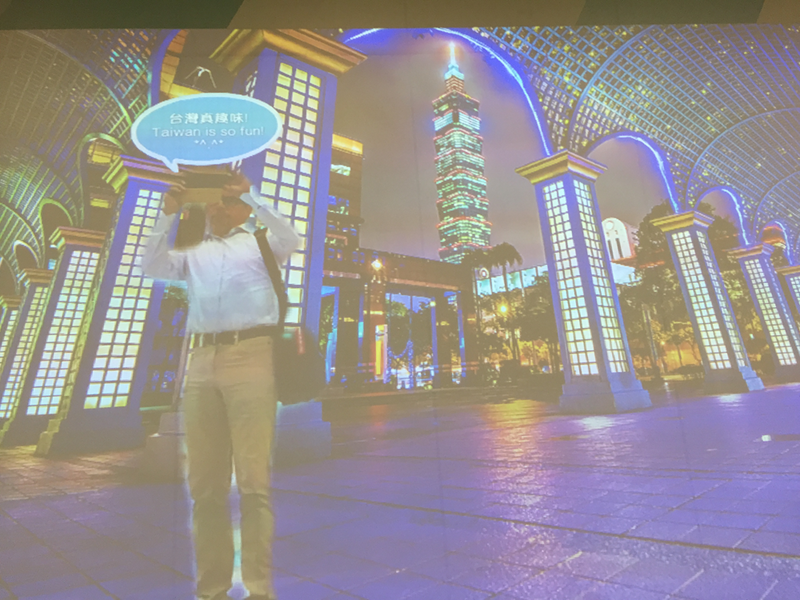 Screens have in general become more important for OOH but this AR feature, commissioned by the Taiwan Tourism Board’s agency shows that innovation also takes place in this area. The next big campaign that Moove is working on is for the opening of the Down Town Line at the end of 2015. This is the 2nd of the 3 phases leading to completion of this new MRT line. The basic idea is to select agencies. Each agency is to develop a campaign for the new stations on the line around a theme of their choosing. The stations are to be completely transformed through the use of screens, billboards and 3D installations and should entice people to use public transport instead of their cars. We are curious to see what this will bring but if the success of the NPB and Spot Me campaigns is anything to go by it will certainly create a lot of buzz, in Singapore and abroad.